Android is the most used and popular mobile operating system in the world. We use our Android to socialize, to make calls, send texts, play games, listen to music and much more. It is a platform where you can interact with new people, old buddies, strangers and colleagues as well. Like every year, Google Play Store has announced the winner apps for the most social category in 2017. In this post, we’re going to share the list apps that reserved their places in top 5. So, let’s have look at them! Share your love for reading with your friends and family with Litsy. The app allows users to read and share books with people in their network. The app allows you to capture all your thoughts even while on the go. It is an excellent platform where authors and passionate readers share their thoughts about their reading moments. So go ahead share all your bookish thoughts, follow your favorites, get to know their thoughts and most importantly stack your favorite books to read whenever and wherever! Using Litsy is not only fun but also free to use. ?It’s a simple and spoiler-free app that helps you improve your vocabulary and kill your spare time. Billions of people are keen to learn about foreign culture and languages. Tandem brings fun to learning by finding a perfect language exchange partner from across the world to help you become fluent in a language of your choice. Tandem is a free app, which has been developed by Tripod Technology GmbH. It helps you practice languages with people across the globe. The app comes with more than 150 languages and over 2500 language combinations. Moreover, it is a new and interesting way to communicate without knowing each other’s language. Strava Running and Cycling GPS is trusted by millions of runners and cyclists to track and record their activities throughout the day. The app allows to compare your performance over time, share your achievements and new records with friends and colleagues. The app lets you showcase your great moments of run or ride on Facebook, Instagram, and Twitter. As Strava works with GPS, you can pair the app with your running watches, cycling computers, and activity trackers. It is a great app that can be used to communicate with your team. You can organize your conversations by topics and projects, to talk with your entire team into one place. Slack is a remarkably productive app that you can use for a small business and for a larger organization as well. As slack is available on almost all devices, you can always stay in touch with your team no matter where you are. With Slack, you can make a call, message to any one person or group within your team. The app allows you to share, edit and view documents with ease. In fact, you can customize your notifications so you stay focused all the time. Kudos is a simple, free and ad-free app that is loved by kids. It is an intuitive tool that lets kids share pictures and comments with others. Moreover, parents can also update what their kids are up to with Kudos. It is a fantastic app that allows to you talk to your friends in a fun way and send reactions on every post and picture they share with you. It is an easy to use app that comes with a user-friendly interface. 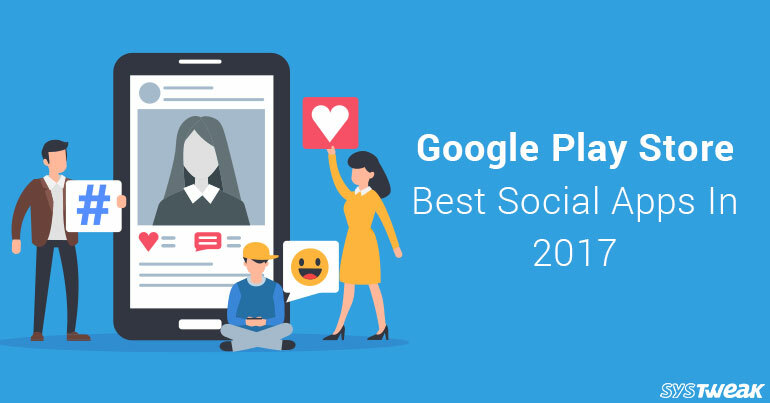 So, this was the list of award-winning Android social apps that won millions of hearts with their mind-blowing and stupefying features this year.